Our 6th annual race will be held on Saturday, December 7, 2019. The race starts at 12:00pm. Day of race check-in and registration will take place from 10:30–11:30am at the American Legion Post 579 (60 Main Street, Cooperstown NY 13326).. 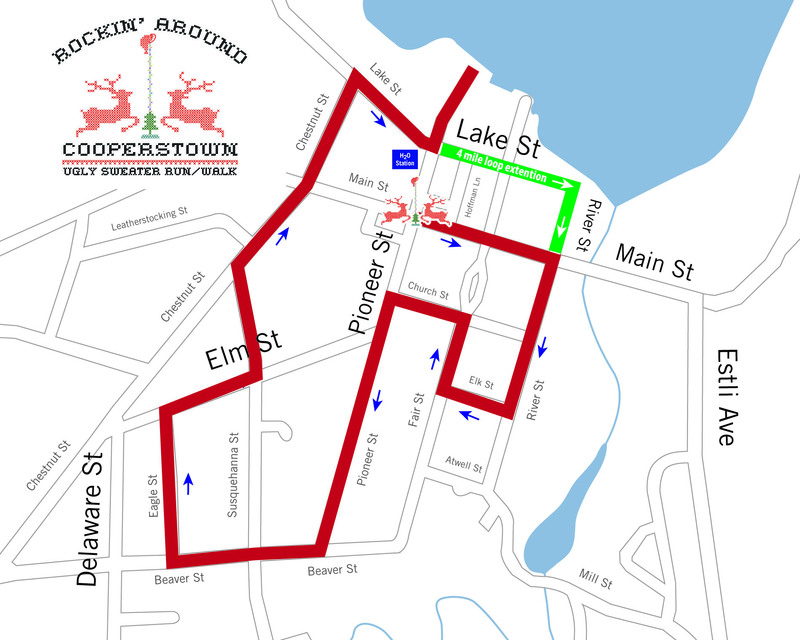 The Cooperstown Chamber of Commerce and Clark Sports Center partner to host the “Rockin Around Cooperstown Ugly Sweater Run and Walk” on Saturday, December 7, 2019. The event will encourage runners and walkers to venture through historic Cooperstown in their ugliest holiday sweaters and encourage patrons to shop and eat local, while visiting Santa’s home. Upon completion of the race, participants will receive either a free coffee/hot chocolate courtesy of Stagecoach Coffee or a free beer from Brewery Ommegang (coupon valid until 5:00pm on December 7). Cooley’s Stone House Tavern will be the location for the Ommegang beer. The event will showcase Cooperstown’s beautiful Main Street and provide an opportunity for restaurants and retailers to showcase their businesses to the crowd of locals and visiting attendees. We encourage residents and visitors to visit the Cooperstown Farmer’s Market beginning at 9:00am before heading to this event. Everyone is invited to attend this unique event. The race will begin at Santa’s House in Pioneer Park at approximately 12:00pm with Santa himself giving opening remarks. This race is the third race in the Frozen Toes Race Series. The Frozen Toes Race Series includes the 47th Annual Bob Smullens 5k/10k Race (February 9), 3rd Annual Frozen Toes 5 Miler (February 16), 3rd Annual Not so Frozen Toes 5 Miler (March 16) and the Rockin’ Around Cooperstown Ugly Sweater Run/Walk (December 7). Participants must compete in all races to receive a custom embroidered series sweatshirt. The first 100 registered racers will receive a commemorative ornament. Race registration will take place 10:30–11:30am at the American Legion Post 579 (60 Main Street, Cooperstown NY 13326). Pre-registered runners and those who wish to register on the day of the race may do so from 10:30–11:30am at the American Legion Post 579 (60 Main Street, Cooperstown NY 13326). Prizes will be given out for the Ugliest Sweater, the Ugliest Team Sweaters, and based on participants finish in the race. Awards will be distributed to the top 5 male and top 5 female finishers, 21 years of age and above. They will also be distributed to the top 5 finishers under 21 years of age. Winners will be announced at the conclusion of the race, tentatively around 1:30pm. The Awards Ceremony will take place at Lakefront Park. Dress Warm and in your ugliest sweaters! Coffee, Hot Chocolate, and Beer to follow! Please note that traffic will be allowed on all streets. Major intersections will be staffed.